Forget ads. Plan with The Information Ecosystem. Six years ago, as enthusiasm over a new thing called “social media” began to crest, Pepsi went big on social. In 2011 PepsiCo slashed outbound advertising on its Pepsi brand, and redirected communications budgets to Twitter, Facebook, and other inbound social community management. That didn’t go so well. By March of 2012, sales of Pepsi had slumped and for the first time in two decades Pepsi fell, embarrassingly, to the No. 3 soda brand behind both Coke and Diet Coke. Broadcast — not just TV, but here defined as any mass medium “broadcasting” outbound to large groups of people. Personalization — another form of outbound messaging, but this time tailored to a few. Research — the inbound analysis of communications from groups. Engagement — the inbound communications from one person, or just a few. But let’s revisit what this means. First, this ecosystem is not just about media tactics. C1: Customers in group “C1” have different needs and varying financial value to you. Strategy: Personalization. Why? Your customers need different things, and if you can personalize to the most valuable customer micro-segment, you’ll maximize profits. For this customer group, investments in personalization are required. Examples include real estate, financial investing, travel, fashion and luxury goods. There’s a reason why airlines have numerous loyalty schemes, boarding segments and seating assignments. That lady up front needs something special, and she’s worth a lot more than you. C2: These customers, group “C2,” have similar needs and rather static financial value. Pepsi drinkers go here. A casual Pepsi drinker might imbibe three sodas a month, and a heavy loyalist 30 Pepsis, but that 10:1 ratio really is not enough to justify the expense of personalization. And all these customers want the same thing — a sweet drink. So take out a TV ad or run an OOH campaign; your strategy is to Broadcast outbound messaging to a mass audience. The lower costs of mass media will simply get the job done. C3: For inbound communications, marketers who wish to understand what drives a common need use Research. Inbound inputs from masses are gathered and sliced, but the result is typically a product-centric view, collating the needs of a group around a given sales item or media goal. Nielsen ratings evaluate who watches show A or listens to radio station B; comScore ranks who watches website C; qualitative or quantitative research uncovers which customers will buy product D. Consumers’ financial values may vary greatly, but research is focused on understanding common needs. C4: Engagement is the wild card of the matrix, the area for inbound customers with very different needs — and best if your customers have a range of value. The temptation for marketers to rush into this quadrant is enormous; who would not want to provide individualized answers to any customer question, in an effort to both solve problems and sell products? But this Engagement strategy works best when your customer base wants many different, nuanced things, and provide enough profit to justify the expense. At this point, you can easily see where Pepsi’s rush into social went awry. One-on-one social engagement is not needed when all a customer wants is a sweet sip. Which brings us to the final question: which inbound and outbound strategies go together? Ah, sharp readers will have guessed — it all revolves around your customer base analysis. If your customer group varies in what they need, outbound personalization should be matched with inbound engagement (C1 and C4); our agency, for example, works with a fashion e-commerce brand that combines hyper-targeted, personalized outbound advertising with high-touch inbound human service. For customer groups where the needs are varied, and where some have extremely high value, this combination is powerful. The only caveat is to make certain one portion of your customer base provides enough financial value to your business to justify this micro-segmentation and personal service. But if your customer group contains similar needs, outbound broadcast mass media can be matched with inbound research to great effect (C2 and C3). Traditional research segmentation studies can be used to direct cable television schedules. ComScore ratings will tell which websites have the greatest reach among the largest slice of your target. Analyzing what makes one large group tick is enough to push out messaging that reaches the same large group at the lowest media cost. There are of course many layers of nuance behind this Information Ecosystem strategy. Broadcast media are becoming more targeted; addressable TV, for instance, can reach households down to the PII level with personalized commercial breaks based on your past shopping behavior, and technical advances in some digital billboards can recognize the demographic composition of the audience viewing them. Social can be used for research, and research can be used to identify niche group needs. As media outlets advance to the future of Minority Report, communication lines will bleed across all channels. Which is why this model is useful. As you plan your communications strategy, it’s worth starting with an analysis of just how unique, or common, your target audience is. That one question will help you model whether you should invest in personalization and engagement, or simply research how to go for mass communications scale. Conventional wisdom has it online video spots need to be short, 15 seconds max, because most users click away in impatience if you go longer. Media buyers prefer to stick such ads before the video content users really want, in a format called “pre-rolls,” so users have no choice but to sit through them. So it’s interesting TED has pushed back by promoting ads 2-3 minutes long that run after its online video content … so good, apparently, that users will not only watch but share the spots with others. Noteworthy because TED is smart, and TED has a rich audience. Since its launch in 2006 TED has become a global conference juggernaut, expanding from a California elite speaking club with the likes of Bono, Bill Clinton and Jane Goodall to 750 subbranded “TEDx” events held annually around the world. TED.com’s free replays attract a fine demo: 50% of TED.com viewers are age 50+; 33% have incomes $100k or higher; and 23% have gone through grad school. If you’re selling BMWs, TED is your ticket. What does it mean that an intellectual portal attracting the wealthy and educated is pushing long-form video? Perhaps if your content is good enough, audiences have the patience to pay attention. Bonus round: If you want to taste TED’s speakers, don’t miss the brilliant Sir Ken Robinson. Ben Kunz is vice president of strategic planning at Mediassociates, an advertising media planning and buying agency, and co-founder of its digital trading desk eEffective. The fastest-growing media? Old, stodgy TV. 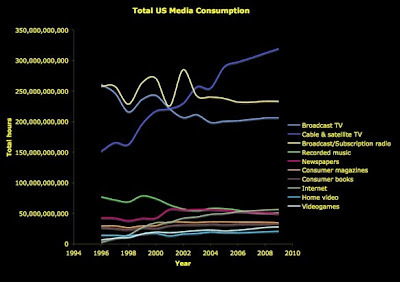 Wired magazine co-founder Kevin Kelly ran some numbers and found that television vastly outranks all other media in terms of hours used by U.S. consumers. Cable and satellite TV are the fastest-growing communication formats in terms of consumption, with Internet use a comparatively small slice of the media pie. How much? The average U.S. consumer watches 1,685 hours of TV a year, nearly equal to time spent working for a paycheck. Wolk’s point is worth a bookmark if your digital agency claims the :30 second spot is dead. Online and mobile devices have emerged as core components of any media plan — yet don’t forget all the new flat-panel TVs in basements, or radios on long auto commutes, being put to good use. The question for your agency is if old formats of media are still thriving, how do the various new pieces fit in context? Saneel Radia at BBH Labs suggests that media (defined for non-ad people as messaging conduits such as television, radio, print, online banners, etc.) should now be considered as important as advertising strategy or creative in influencing people. In a perfect example, he mentions music — and how the shift to iPods and digital formats and playlists has had enormous impact on how music itself is structured. 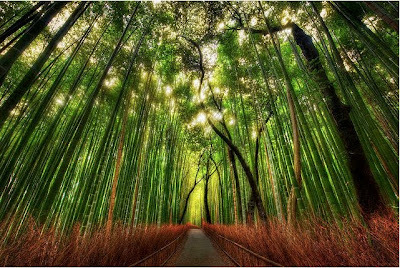 The channels influence the idea within, just as paved highways have altered the designs of our vehicles. This is not a new idea, of course; Marshall McLuhan wrote in 1964 that “the medium is the message,” with the channel format influencing how messages are perceived. Yet Saneel builds on this, suggesting that individual media channels should not only be evaluated for how they affect message, but be planned to influence differentiated response (what Saneel terms “experience”). Differentiated response? This seems confusing at first for marketers used to targeting A person with B message through C medium, akin to splitting a single strand of spaghetti at the ends, so let’s use skateboarding sneakers on YouTube as an illustration. A shoe brand such as Vans could reach its audience in many ways: passive viewers could watch a YouTube video featuring the sneaker, or users could forward the cool video to others, or manipulate a video, or even create their own user-generated content filming kids in the backyard in Vans leaping off ramps. Saneel calls this the 1:9:90 rule: “If 1% of the audience drives the experience, 9% participates, and 90% just consumes, wouldn’t a brand want to understand each stratum of people, and how the experience could fit them appropriately?” With the biggest trend in media now being concurrent media use, for instance, teens texting on mobile phones with a laptop on their knees reading Facebook while watching TV, consumers taking different response pathways is now part of life. And therein is a disconnect. Marketers still often focus campaigns on singular objectives such as lead gen, sales, brand awareness, product launch, and then set up media strands pointed at each target and desired response. Customers, however, interpret brands in any way they want, and engage or react or respond in multiple pathways. Any single message in any individual media channel can push consumers in different directions. The solution is simple: evaluate all the ways customers could respond from messages in each channel, which types of response provide value, and then restructure your medium-message accordingly. Product differentiation was a 1940s idea. Brand differentiation was a 1970s fad. Customer differentiation rose in the early 1990s. Today, it’s time to differentiate media response. Why do CPMs still exist? We’ve been critical of Razorfish reports in the past and so must tip our hat to that digital team for its insightful Razorfish Outlook Report 2010 — which not only lucidly addresses major trends in online marketing, such as the rise of ad exchanges, but also offers a candid peek inside Razorfish’s own business. One curiosity in the report, however, comes in the section where Razorfish discusses the impact of the 2009 recession on client media spending. Their clients, similar to yours if you work in the ad business, made the expected moves: shifting ad spend to direct-response channels, using discounting in messaging, moving more funds to paid search. 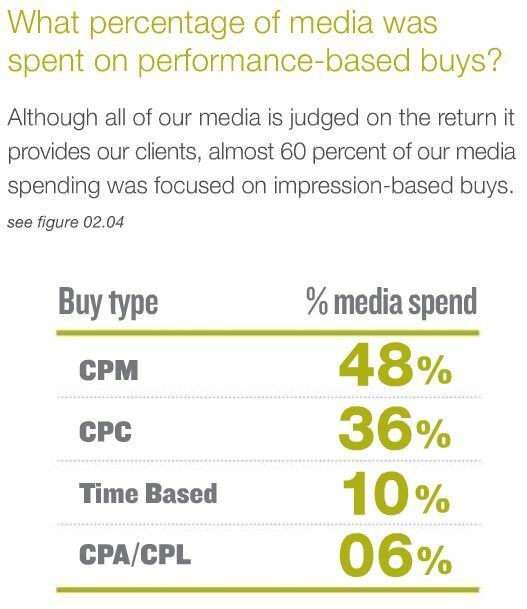 Yet the big surprise was 48% of online ad spending was still placed on a CPM model — the type of buy where you pay for impressions no matter who clicks on or responds to the ad. 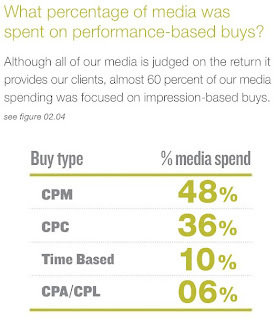 CPMs stand for “cost per thousand impressions” and are one of the great artifices of the ad industry. They are fiction, you see, because most “impressions” don’t really reach consumer retinas at all. In newspapers, readers do not scan every ad on every page; on television, the average U.S. household has access to 130.1 channels but tunes in to only 17.8. The rise of tighter measurement tools in radio known as portable people meters exposed the fact that consumers often turn the dial when :30 second radio spots come on — news so bad that Arbitron, the radio ratings service, launched a PR campaign to try to convince ad agencies that fewer impressions were a better value! The vast majority of ads run in any media are never seen. CPMs, in other words, are a currency used to place a value on a media audience — and just as a paper dollar has little to do with real gold, you should never confuse an impression estimate with an actual frontal lobe synapse firing. 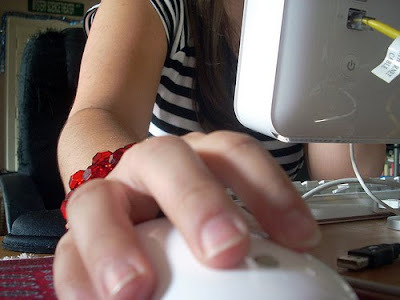 On the web, pay no attention to measurement? CPMs in the Internet arena are no different. One has to wonder, in the year 2010 when we can conceivably tag every computer browser and track responses in the forms of CPCs, CTRs, CPAs, conversions, even cost per sale, why nearly half of all online ad buys are still pushed through the weak CPM pricing system. This is no knock on Razorfish; our clients do the same thing, since the online marketplace demands it. The truth is there is huge resistance inside the industry by publishers, who aggressively (and fearfully) defend impression-based pricing structures which pull revenue no matter what the result. Online pricing schemes remain the Wild West of media — it is possible to spend $60 CPM to reach an elite audience at WSJ.com, or $17 CPM if you negotiate shrewdly, or $6 if you are clever enough to lift the audience and chance them with retargeting. Ad networks can drive down costs even further to below $1 CPMs, and buys using the cost-per-click model remove potentially all waste in the top of the funnel. So what does it cost to reach 1,000 wealthy consumers online? A buck or 60 dollars, take your pick. Yet CPMs persist. They are in fact a necessary defense for all content publishers, as the inventory of communication channels rises to infinity and switching costs fall to zero. The only way to make a margin with any material is to build in waste, and fight to keep that frictional source of profits. To paraphrase John Wanamaker, half the money you spend on advertising is wasted, and publishers really, really want to keep it that way. Would you launch a Valentine’s Day promotion in September? Of course not. 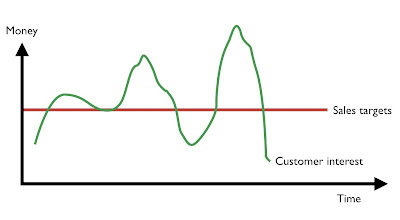 But it’s an interesting strategic question if you ask your business peers “is our advertising campaign in line with the peak periods of our customers’ demand?” Every product has seasonal cycles of consumer interest (pop over to Google Insights for Search for a peek at yours), yet oftentimes marketing budgets are driven by corporate requirements to hit certain sales targets each month. It’s tricky. If you have $1 million to spend on advertising over 12 months, you’d want to deploy it at the periods of heightened interest that will pull the most sales per dollar spent. But if you’re running a real business, you may need to push harder in fallow periods to keep your staff or supplies moving. The only way to solve the puzzle is to build response models that compare the potential upside of pulsing advertising with high demand vs. the cost downside of a business operation sitting idle in the off months. The real question: Is anyone at your advertising agency asking this question? If you dig hearing people argue about the future of advertising you might like this week’s BeanCast podcast. We joined in the debate Sunday night with marketing gurus Bob Knorpp, the host; Joseph Jaffe of Crayon; Edward Boches of Mullen; and James P. Othmer, author of Adland. One key question that emerged was if advertising, including direct marketing, is really an “impression currency” that is being devalued as consumers learn to share their own content, how can marketers possibly make advertising work? We think it comes down to three choices: Marketers can try to improve targeting (with sharper media buying and ad performance measurement); they can try to improve relevance (with product attributes, design, or creative that tell real stories vital to real people’s lives); or they can increase shock value. 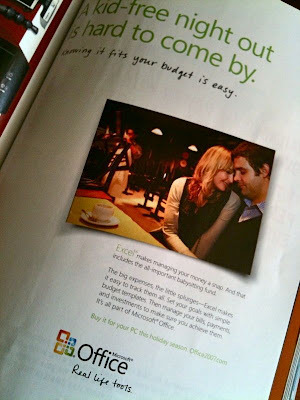 The shock option explains why users of Microsoft Office will have hot dates with women who put their hands in your lap. Engagement is a fuzzy word tossed about by ad gurus in black T-shirts to describe consumers who have interacted with or, better yet, begun spreading news about your brand. Procter & Gamble put some teeth behind the engagement concept this week with a media brief issued to online publishers in the UK. P&G announced it will pay publishers more money for “engaged” users as tracked by specific metrics — for example, consumers who sign up for newsletters or watch videos after the initial ad impression. The move is really a pay-for-performance play, focused on the conversions of people to action and not the oft-fictitious CPMs or fraud-laden CTRs. P&G has serious clout; it is the world’s No. 1 advertiser, dropping more than $9 billion annually to push brands such as Crest, Tide and Pampers. But not everyone believes the model will stick. Nick Suckley, co-founder of media shop Agenda21, told New Media Age he thought cost-per-engagement online ad models may be slow to take off in the absence of hard, consistent metrics across the industry. “The point is how can you measure the real effect of someone engaging?” he said. “It’s impossible.” We expect publishers to push back as well; charging only for the ads that truly work will expose marquee web sites as having a boatload of ad inventory that often doesn’t work well at all. Which form of advertising works best? 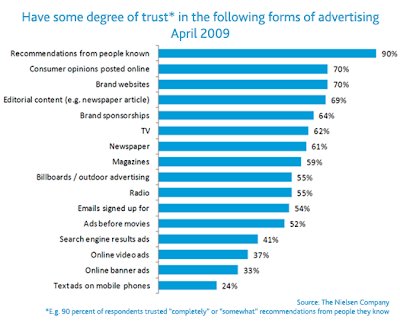 Dirk Singer at London PR shop Cow has posted several recent studies on how consumers evaluate different forms of advertising. Word of mouth and online opinions carry the greatest weight as advertising with “some degree of trust,” which explains why brands are racing to get into the stream of Twitter and Facebook conversations. However, marketers should be careful not to read too much into the hyperbole about emerging media. U.S. consumers spend 5 hours and 9 minutes a day on average in front of the television set, so TV remains a powerful ad medium for brand launches and product education. Online member communities get buzz, but use of search engines has consistently outpaced social media for the past six years. Twitter and Facebook are everywhere in the press, but ad formats inside social networks are still struggling with low response rates, and it’s worth noting Facebook missed its revenue projection for 2008 — derived mainly from advertising — by more than 33 percent. It’s also noteworthy that advertising is judged by the economics of those who respond, not those who don’t. So even if 99.9% of people fail to trust your medium, if 0.1% do — and they become customers at an acceptable cost per sale — then the ads have worked. After all, you once dated before you married, yet you didn’t marry every potential mate in the world. Your “romance marketing” gave you just the right personal response. We suggest advertisers view emerging media as a worthwhile investment, but only for a fraction of their media budget. The best source of data remains monitoring what works in responses, and then adjusting your mix based on your own results. For a detailed methodology of how to monitor advertising effectiveness, visit our whitepapers here.